I would like to offer a new possibility to analyze the game that would allow to significantly shorten the time of detecting errors in the strategy that you use. Instead of spending long and boring hours analyzing your own base and searching for leaks, now you can email your hands and receive a detailed report file with a list of mistakes and places in the game on which you should concentrate. The research system allows for the most detailed analysis of the game compared to similar offerings. More than 1600 filters are used, allowing you to identify the line of play in which you have shown a negative profit (minus) or, in some "expensive" lines, an inadequate plus. 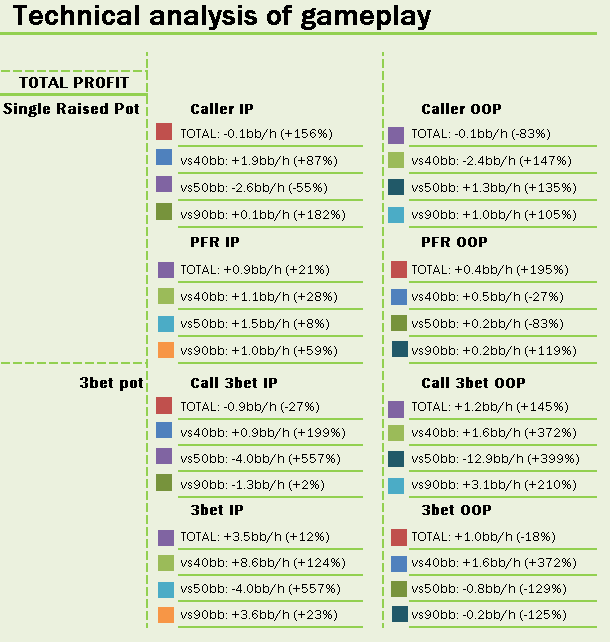 Game analysis is produced using usual one-on-one pots (SRP 1vs1) and three-bet pots . After you sent the hands to be analyzed, in 5-10 hours you will receive an email with a report file. 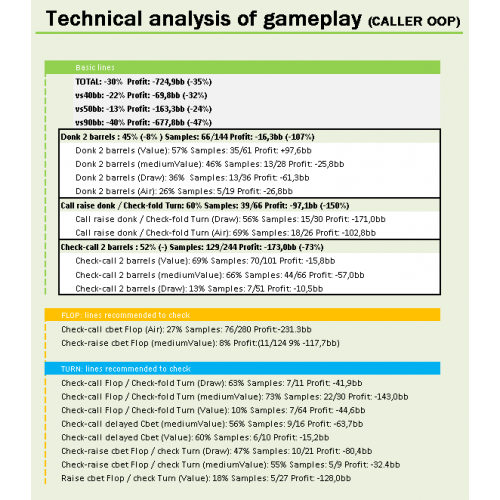 The report is an Excel-file, which contains both general information about your play as a caller and a preflop raiser, as well as data found in the minus lines of four game situations: Caller in position (Caller IP), Caller out of position (Caller OOP), Preflop raiser in position (PFR IP), Preflop raiser out of position (PFR OOP). ​Final line profit in bb. 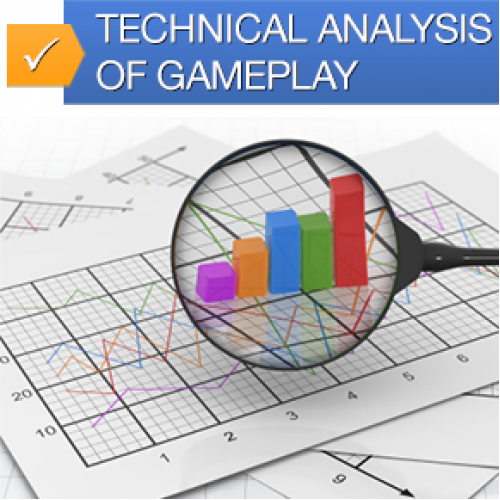 This study is intended to identify strategy locations where you encounter the greatest "gaps" in the game, and the report clearly shows with what "hands" and in what situations decisions were not sufficiently scrutinized. 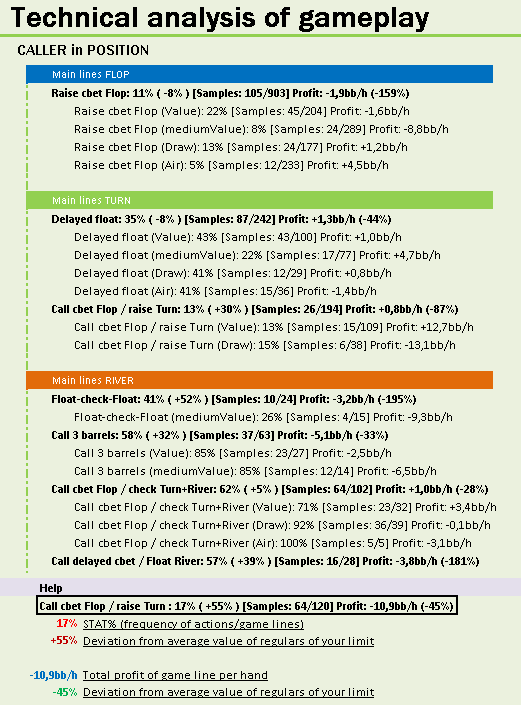 «TOTAL» Page: profit data by position, when you play as a caller (Caller IP/OOP) and preflop raiser (PFR IP/OOP), including against different stacks (Total/vs90bb/50bb/40bb). Caller OOP Page: a list of minus lines as a caller out of position. The page shows Main lines and separately Lines divided by hand strength (Value / Medium Value / Draw / Bluff). Clarification #1: To facilitate the post-flop analysis and to achieve a "visual" understanding of the game, all Main lines of play are supplemented by Lines divided by hand strength, with positive, and negative profit. Clarification #2: For some variations of plays the sample may be insufficient, therefore in order to produce statistically valid conclusions and to avoid additional errors, a minimum sample threshold for inclusion in the report of 5 cases for each line of play is set for all lines. -16,3bb: Final profit of the bb line. Was the required data needed to make a correct/profitable decision in this play available and employed.